Dear Friends, have you ever made something that deep down you knew wasn’t ideal but secretly you hoped would work out? Like, for example, an elastic waisted skirt? 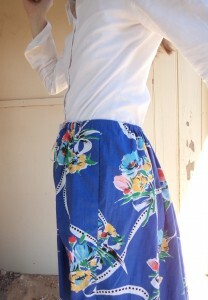 I made myself an elastic waisted skirt to wear last summer; I wore it only once. 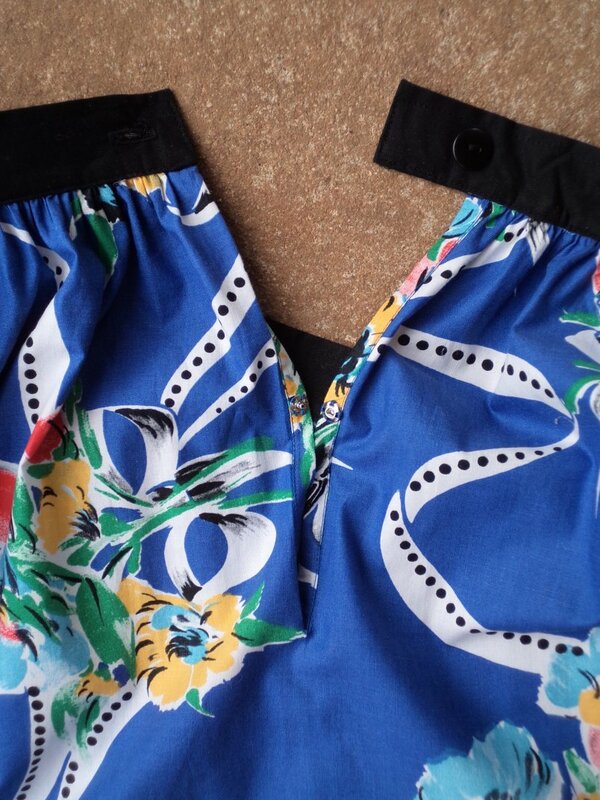 It was a foolish notion for someone who doesn’t really have a waist to go ahead and bulk it up with elastic gathers. 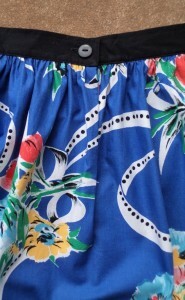 Trying to think back, I haven’t worn an elastic waisted skirt for about 35 years. 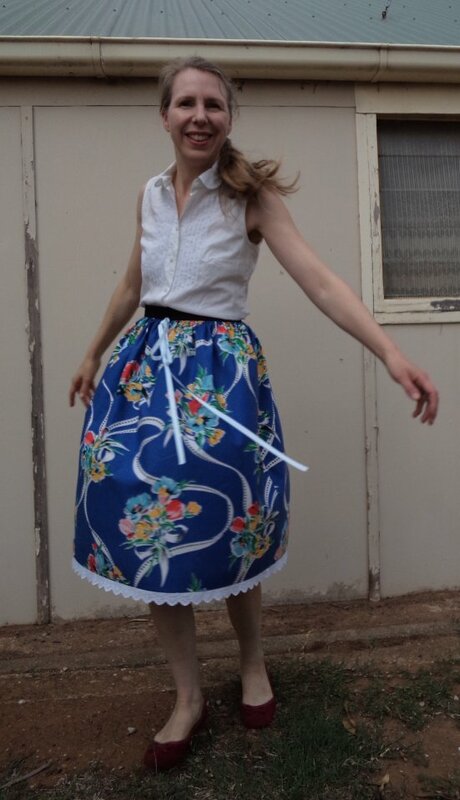 I made the skirt from a length of 90cm wide op-shop fabric, and there was just enough to cut a rectangle for the back and front. I added in-seam pockets (in another fabric), white broderie anglaise lace at the hem, and a white ribbon bow at the front. I planned to wear it with a fresh white blouse. 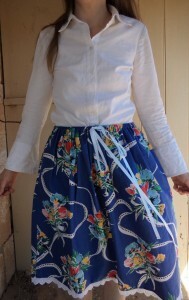 The skirt is one of the prettiest I’ve made. The bouquets and swirling ribbons made me think “French countryside”…..the magazine version, that is -you know, picnics in flower-filled meadows, boating on rural canals, rustic farmhouses with cobbled courtyards, that sort of thing. The waist on this skirt has gone through four incarnations. 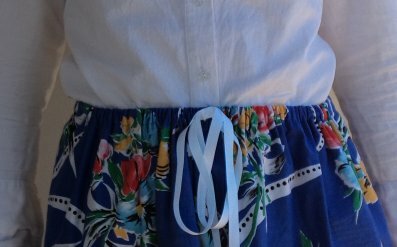 Originally I made it a drawstring waist with white grosgrain ribbon, which was annoying to pull up the gathers each time I put it on. Then I changed the drawstring for elastic which made my waist look more non-existant than it was already if that was possible. Third try, I re-distributed the elastic gathers to the centre front and back, leaving six inches of flat waist at each side and machined through the elastic to hold it in place. An improvement and I wore it this way, but I disliked the slack feeling around my waist and how the skirt sank down when I put things in the pockets. Most people would have given up by now, but I really liked the skirt so I pushed on and did what I should have done at the start: a waistband. I had no more skirt fabric and couldn’t get a matching plain, so used black. 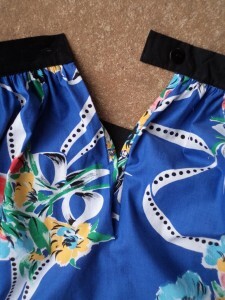 The second problem was that I couldn’t install a side zip because of the pockets, so when I unpicked the elastic waist I trimmed one inch off the top and used it for a narrow placket at the centre back. It was just wide enough to sew a press stud on. I threaded the white ribbon through the front buttonholes left from the drawstring attempt. It’s great to wear now! 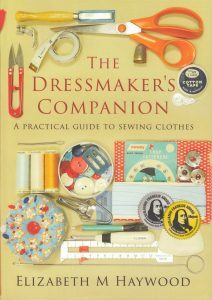 As an after-thought, I sewed two buttons on the back; one for wearing before dinner and the other for after! Had to laugh at the button! Covering all your bases. Hi Val, Isn’t it a good idea? I might do it on all my skirts! You certainly worked your way through and it was worth it – a lovely summer skirt. What a pity we are heading into Autumn/winter. Thanks Lilian, I did get there in the end. Yes, I think I have missed my chance to wear it now, but I will be ready for spring. I might find some other tops to put with it before then -pale lemon? mint? pink? Since I do have a waist I can mostly get away with an elastic waist skirt. Something I’ve done in the past is make the elastic top as usual then add 2 or 3 belt loops and make a sash to go through them. This covers the elastic part and adds a nice tied part to wear on the side or slightly off centre. Hi Sarah, thanks for mentioning this -sounds like an easy way to make an elastic waist not look like an elastic waist.